LaurieAnna's Vintage Home: Some like it hot - NOT! Some like it hot - NOT! Thank you for making this past Canton the best May show we've ever had! Both locations enjoyed fabulous attendance and sales. 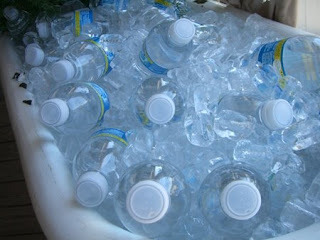 Although the Texas heat did drive customers into the store where they enjoyed bottled water and AC!! Hubby and I have spent the past couple months on home renovations....I have much to share! The veranda and the bottles of water look great! 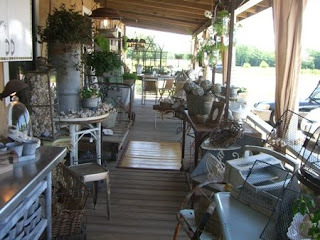 looks like it was a lovely show- love the porch set up! Everything was lovely, we are looking forward to your home show this Fall! I was curious about your floor mats you have for sale. Could you e-mail me? ora.nobis@gmail.com. Do you still sell the beautiful bamboo floor mat with writing on it? Congrats on a great show. Glad Mayron got to stop by and say hi. Look forware to pics on your house projects! Hey Laurie... Just popping in to say hello... Hope you and sweet hubby are doing great.. Can't wait to see the home rennovations!